Why this new price plan is the best deal of 2017? Mobile data plans were called Mobile Broadband originally and the terms are used interchangeably. Using the service involves just a SIM which can go in to any device which operates on the Optus network frequencies. Examples include a SIM enabled tablet (such as an iPad) or a mobile ‘dongle’ modem for a laptop. SIMs can either be inserted in the laptop, tablet or an external device depending on the circumstances. Typically, all the data is for use in Australia and the plans include either no voice / SMS component or a PAYG voice element. OVO Mobile, a telco which is getting a bit of a reputation for disrupting the industry launched a version of this type of plan (in August 2016) which has stunned the market. OVO’s plan was $59.95 for 50GB. That pricing is the best in market of any carrier we’ve seen. Read on to find out why this plan is such a big deal and why so many Australians are buying it. This is an article about a single tablet data plan, the OVO $59.95 plan. If you’d like to see the full range of tablet / mobile broadband plans we have those on our Data Plans page. Or you can see all SIM Only Plans. We don’t usually write full articles about price plans. The dollar / inclusions details in the plans of each operator change all the time. That can means our content is out of date (by the time it’s found) and that can lead to people making the wrong decision on the SIM Only Plan or Prepaid Plans to buy. That’s the opposite of what this website is here to do. 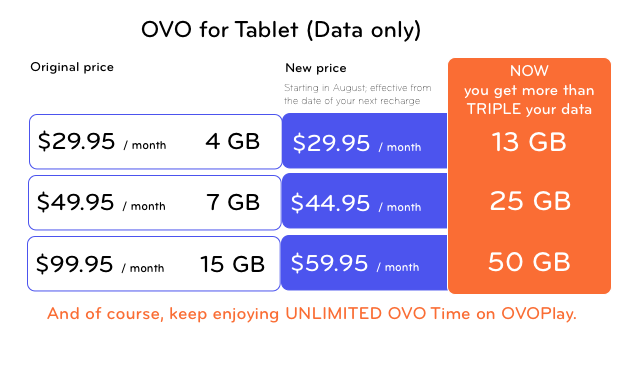 However, since the launch of OVO Mobile’s new price plans at the start of August, we’ve seen a huge numbers of sales of this particular plan. Taking a look at what’s underneath this phenomenon offers interesting insight in to the impact that the new OVO range has had on the market in the few days since it launched. Optus are the only telco who have taken the bold step of offering this sort of plan before OVO. Comparing Optus and OVO, OVO wins hands down. For a start, Optus charge $10 more (their 50 GB bundle is charged at $70, compared to $59.95 for OVO.) In fact, Optus limit the speed of their mobile broadband SIM, where OVO don’t, so in some ways, although they use the same network, OVO’s plan is better. The key point to remember here, when putting Optus and OVO side by side on the plan, is that you will get exactly the same coverage with either OVO or Optus. The closest service Telstra offers to OVO’s $59.95 plan is $55 for 10 GB of data on a postpaid month to month agreement. It’s not surprising to see Telstra struggle to keep up in this area. Despite the 5 outages they’ve suffered this year and independent evidence suggesting that Telstra’s network is no longer the unqualified best Telstra still insist on trying to charge a premium for the phone services they offer. Data now represents the majority of value that users derive from a phone plan. If Telstra start offering 50 GB for $59.95 on data only plans, they would be undermining their more standard, higher volume voice and data plans – which also start at $50 ! This creates a bit of a Catch 22 for Australia’s biggest telco. They will be hoping that not too many people notice OVO’s new plan. Telstra’s fixed broadband plans begin at price points of $80 per month. That will get you an actually quite generous (considering we’re talking about Telstra here) 1000 GB of data at ADSL speeds. Optus Fixed broadband pricing starts at $80 as I write this article. It provides unlimited data through an ADSL connection for $80. Sometimes I get too excited about new technology and the events of telco. But this time, I mean it. $59.95 for $50 is such a difference in data inclusion from the mobile rates that proceeded it that it will change the market. People are going to start using mobile data for things they previously only did on fixed broadband connections. OVO’s $59.95 data SIM can be used in any number of real world scenarios. It’s this that holds the core of the appeal of this mobile broadband plan from my point of view. I can absolutely see families driving around Melbourne, Sydney or some other well networked part of Australia while the kids stream videos. Keeping the family entertained on the way home from school with a tablet showing YouTube videos of people unwrapping presents (If you don’t know, that’s ‘a thing’ apparently) is going to become a regular occurrence. In a business context, taxis, Ubers, busses and ferries could all benefit by adding this sort of facility for their users. Tradies can internet equip their office – their car – as they drive around. Video conferencing and SVOD for employees on the road will become commonplace. Salesmen and women will benefit from longer phone battery lives and cheaper access to 4G data buying up front. Most are now tethering their phones to their laptop, using them as a mobile data hotspot and paying one of the tier 1 phone companies $10 per GB for the privilege. OVO’s plan costs just $1 per GB if you use it all. The data speeds OVO provide depend in part on the device you’re using. Only the latest 4G phones can get the best of Optus’ ‘carrier aggregated’ double data speeds. This is several times faster than fixed broadband connections. Such is the success of this plan (judged by the clicks we’re seeing on our site and the sales OVO are reporting) that the result is likely to have more broadly beneficial impact on the world. OVO’s competitors are going to have to offer some form of reaction. Data pricing could come down across the board, which Optus, in particular, will not like. OVO have made the parallel claim that they will always provide their lowest pricing to their existing customers. What that means is, when they drop the price of this plan, you’ll be told and automatically moved to it. Again, this challenges the way telco has worked for the whole of history to this point and is likely to require a strategic response from competitors. As you may know, OVO also offer streamed video content on their plans. You’ll be able to access Australian Drag Racing and Audi Customer racing video catalogues as well as Australian Gymnastics content. This content is provided free to you through the OVOPlay app as part of the service and will not count against the 50GB data allocation. You can find out much more about OVO’s content in our OVO review article. In addition to the above, this plan has a more standard benefit. It’s a prepaid data plan. Prepaid as a payment mechanism is a much maligned and often misunderstood product in telco. For a super-fast mobile data connection likely to be shared between people, it’s perfect. With any prepaid servive, you know that the most you’re going to spend is $59.95 until you choose to recharge further down the line. The ability to know where you are at all times is specially important for a data service which is, as we’ve said, likely to be shared. Users can see this information by logging in to My Account but, in my view, an app is mandatory for telcos these days. As we’ve covered on the relevant page, one opportunity with some phone companies – take Amaysim for example, is to take a data only SIM and use the PAYG voice service which comes with it. Unfortunately, OVO don’t offer any voice service on this prepaid bunde, perhaps understandably wishing to clearly differentiate the two products. You’ll know Optus coverage where you live and work and whether it’s up to scratch has started to fall behind Vodafone in some ways. You can read more about that here. The SIM is not magic. The usual disclaimers apply. It’ll work only when you’re in coverage. You must have a compatible device. All data is for use in Australia. Check the PDS. When we heard about their new range and started adapting the content on the site, we knew that OVO’s new plans were going to be a big deal. They’ve changed the face of telco in three ways at once and one of the most impressive is with this data plan. As most people know to their chagrin, it’s not easy to find a phone or tablet data plan which is different in the market. The problem is not usually that telcos have too many USPs to talk about. With OVO, it is. They have free streaming video content relating to Australian Drag Racing, Audi Customer Racing and Australian Gymnastics included as an extra in their plan. They offer a best price guarantee to their customers. They are selling data at $1 per GB – 10% of the competition’s voice plan additional data inclusions. This is a big day for Australian telco in many ways and these disruptions are likely to keep going. From what we’ve seen, it appears that OVO really ‘get’ (customer needs around) data. They have per kB charging instead of the per MB equivalent some use. They zero rate (provide free of charge) their own content so you don’t have to worry about burning through it watching their videos. These things are the opposite of what the other phone companies do. We’re not a massive fan of OVO’s checkout process for example. (Although buying online through OVO is much, much easier than messing around with Optus’ unnecessarily complex website.) It’s difficult to operate a 50GB plan you’re likely to share when you don’t have a self service app. Additionally, this is not an entirely new concept. They had in car sets two years ago in the UK. The Internet is critical to so many people these days, finding that the same facility was required in Australia is not a surprise. 50 GB is a shockingly large bundle but then the use of data is doubling every year and has for a long time. 50GB probably feels like a lot to you but a few years ago you would never have dreamed that you would be using the 3GB that you currently would, did you ? It’s use cases like the in car transport we mention above which start to set this data plan apart. Whether you buy the plan for a new need or to replace a fixed broadband connection you have will depend on how much data you need. At the moment, there is a way to go before OVO match the fixed line pricing of the competition as you’ll see from our table above. We suggest you keep your eyes peeled, if they keep disrupting like this, they might be matching Telstra’s fixed broadband pricing next week.